Our trivets are comprised of stoneware with a natural cork back. Designed, printed and packaged in the USA. (Note: A trivet is an object placed between a serving dish or bowl, and a dining table, usually to protect the table from heat damage.). 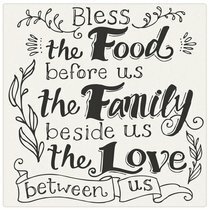 About "Ceramic Trivet: Bless the Food, White/Black"